Classical flow separation control by tangential blowing renders higher inlet flow quality that the fan blades see such that the inlet and nacelle contour can be reshaped or redesigned for cruise performance improvement. Physically, the noise abating aero-acoustic engine inlet, comprising: an inlet exterior surface, an inlet lip surface an inlet interior surface; one or more annular air blowing slots on the inlet interior surface; and one or more annular acoustic lining segments on the inlet interior surface. Inlet noise attenuation business is illusive, with little margin for error, therefore the elements and their configurations in the claims are important. To minimize inlet design configuration evaluations for a specific application, please, review the disclosures in the US patent No. US8234869B2. I am convinced as to the technology and moral merits in the patents in view of the Heathrow and other London airport community needs and the needs of other airport communities in the world. Traditionally, the engine inlet/nacelle system is in the jurisdiction of the aero-frame manufacturers, however current trends indicate merits of the whole engine/inlet/nacelle package that can be supplied by the engine manufacturers They need this inlet to deliver such merits. This patent is the results of many years of innovative efforts including model fan tests in an anechoic chamber. The technology readiness level is TRL 6 or higher, ready for full scale verification and application. The patented inlet is for all by-pass engine applications and all commercial jet airplanes. 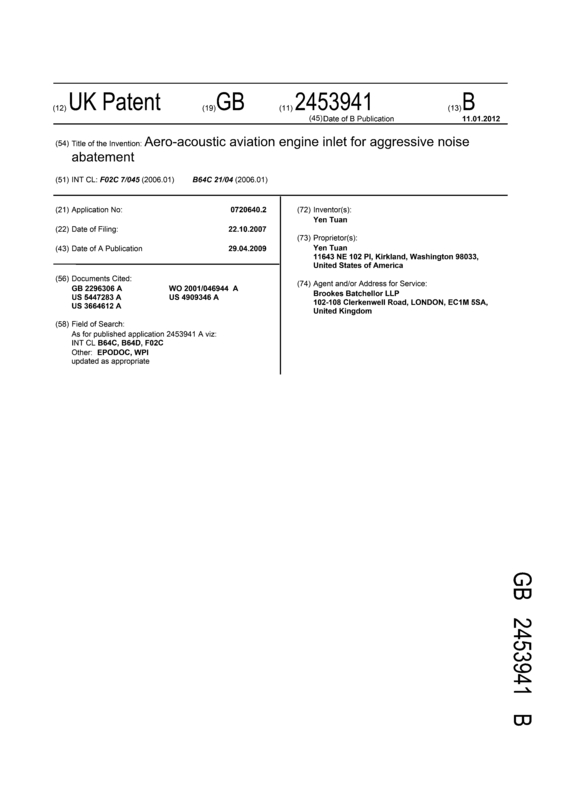 Aviation engine inlet noise reduction has been a continuing concern since the 1960’s. Acoustic lining installed on the inlet interior wall to absorb the inlet noise has been the technology in practice. The inlet peripheral lining configuration has been largely unchanged in the past 40 years. Although the lining design itself has progressively improved to enhance the noise attenuation performance, the overall inlet noise attenuation score had reached a less- remarkable plateau. 2) Invention is unique, no competing system in the market place. performance improvement is an unique feature of this invention. All airplanes, new airplanes or current in commercial fleet , will need this high performance inlet to meet noise regulations or face retirement sooner or later. Please contact the present inventor, should you have any questions and suggestions concerning this UK patent including acquiring the patent rights. Page created at 2019-04-26 18:09:53, Patent Auction Time.